This is hands down the best hot fudge sauce that has ever existed. No contest. It will set the bar so high that every store bought fudge sauce from here out will taste sour and artificial. 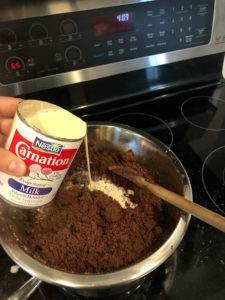 So be careful when you make the recipe for the first time; it will change your entire outlook on desserts for the rest of your life. This is my mom’s recipe, best made with her amazing vintage copper and ceramic double boiler. For those of us without that cool equipment, a metal or glass bowl over a pot of boiling water will work just fine. 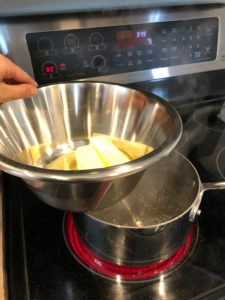 Melt butter in the bowl of a double boiler. Drop in chocolate and allow to melt. Add sugar gradually, a few spoonfuls at a time. Be sure sugar is completely mixed before adding more. 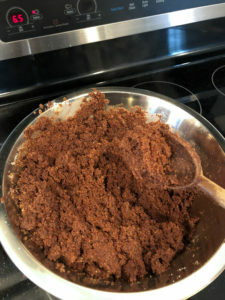 The mixture will become thick, dry, and hard to stir. Slowly sprinkle in the salt. Stir in the evaporated milk, a little at a time. Cook, stirring constantly, until desired thickness. 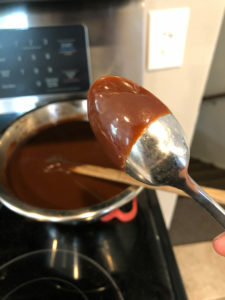 Check thickness by how the sauce coats the back of a spoon. Sauce will continue to thicken slightly as it cools. When desired consistency, serve hot or cold. When reheating, keep an eye on the sauce as it will boil over quickly in the microwave. I will admit that I typically make a skillet cookie as an alternative to a normal meal on the days when I’d just rather eat a bunch of sugar than an actual dinner. Yes, I know… That’s certainly not healthy nor does it cover any legit food groups. It only happens once or twice a year so don’t get too worried. I have found that using a mini cast iron or stainless steel fry pan is best for a skillet cookie. 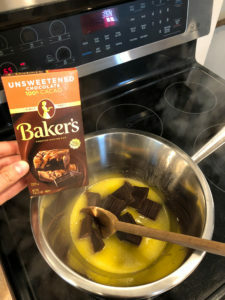 Anything larger doesn’t bake completely in the middle and usually leaves you with way too much cookie for one sitting (especially since it will get too soggy to save if served with ice cream on top). The peanuts in this recipe give a nice soft crunch and offer a different salty flavor than the more popular walnut/pecan addition. Preheat oven to 350º. Rub butter into a 6-7″ cast iron or stainless steel skillet. In a bowl, beat butter with both sugars until fully incorporated. Add egg and vanilla and beat until smooth. Add flour, baking soda, and salt. Mix until just combined. Stir in chocolate chips and peanuts. Transfer to the prepared skillet and smooth out the top. Bake for 20-25 minutes, until tooth pick inserted at center comes out clean. Serve while still warm with a generous scoop of ice cream.